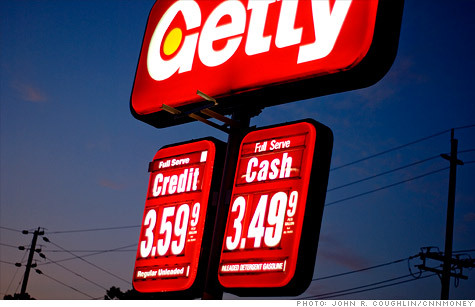 NEW YORK (CNNMoney) -- Oil prices are falling once again, and relief at the gas pump is likely on the way too. But be careful what you wish for. Low gas prices can sometimes be more a symptom of a weakening economy, than a cure to consumers' woes. Crude oil briefly dipped below $80 a barrel on Friday, about 30% below its peak at $113.90 in April. Meanwhile, gasoline prices -- which often fall one to two weeks after oil -- were at a national average of $3.59 a gallon Friday. Gas is likely to decline to around $3.50 a gallon in the next week, estimates Chris Lafakis, economist with Moody's Economy.com. That could be a good thing, he said. After all, lower gas prices give Americans more money in their wallets. At a time when sluggish consumer spending has been one of the biggest drags on the U.S. economy, that's a welcome change. The rule of thumb is that for every $1 decline in the price of oil, American consumers have an extra $3 billion to save, spend or pay down their debt over the course of an entire year. In this case, if oil was to stay around the $80-a-barrel level for a year, that could essentially amount to a $90-billion-stimulus for consumers, Lafakis said. But that's not the entire story. Remember the 2008 recession? Gas prices fell then too, and it still wasn't enough to bail out the American consumer. "There's a fine line here. When falling prices cross the line into deflationary prices and economic activity freezes up, that becomes a real problem," said Phil Flynn, senior market analyst with PFG Best. And the reason for the recent drop in oil prices is concerning. Uncertainty is high given all the political divide in Washington, the S&P downgrade and the escalating debt crisis in Europe. Weak data on jobs and housing lately certainly hasn't helped. Amid those factors, oil traders expect demand for oil and gasoline will fall. "The recent sell-off in oil is because of concern that we may be slipping back into a double-dip recession," Flynn said. "We're being driven by fear right now." Of course, that fear is not just contained to oil traders -- it spills over into the general American public. If uncertainty gets to the point where it paralyzes small business owners from hiring, consumers from purchasing big-ticket items or investors from putting their money in stocks, the U.S. economy slows even further. "It's possible there could be a lot of things going wrong in the economy, and while a decline in oil prices would help to boost spending a little, it wouldn't completely offset weakness," Lafakis said. That said, economists, including Lafakis, aren't ready to predict such a dire scenario just yet. He thinks gross domestic product will continue to grow, but at slow pace of 2% in the second half of the year. "If that outlook turns out to be correct, then the decline in oil prices is just going to help consumers get through the rest of the year and help stave off that second recession," he said.